One of the great pleasures of an eight-year campaign mostly driven by so-called bottom-up world building (really like gender more of a fluid spectrum thing) is that there is a periodic filling in of the blank spots on the map. I had really intended the War Bear march on Pohansko as a set up for some solo matrix wargaming on my end, but some of the long time players jumped in with wanting their characters to march along. I do love every once in a while posing open-ended grand scenarios in which I have no idea exactly how the players are going to tackle it or what the outcome will be, so ka-blamo a simple map and battle roster becomes a whole new campaign area. 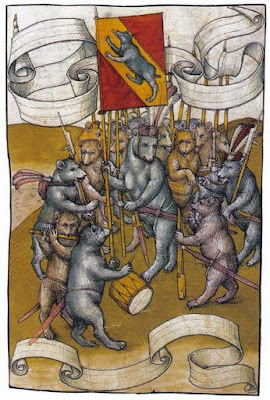 Pinc the Petulant, king-let and spiritual head of the Insufferable Path of Disproportionate Grievance has imprisoned a company of 20 war-bear cadets in lieu of paying back wages (and into their woefully underfunded dental fund). 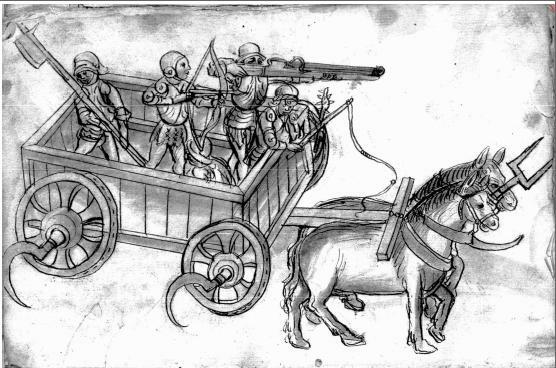 The war-bears sit polearm-deprived and deeply despondent in the dungeons of Pohansko, a tiny micro-kingdom and fortified trade town in the wilds south east from the Cantons. Medved, master of Slumbering Ursine Dunes and all things bear, has called the general muster for all warbears. In solidarity (and applied needling from the Guild of Condotierre, Linkboys, Roustabouts, and Stevedores) the Rada of Marlinko Canton has sanctioned the formation of a volunteer company complete with battle-wagon train. What are the Forces Involved? The fast-moving Vanguard Column of 90 young war-bears is led by the magnificently gruff and spirited Commodore (purely an honorific and ironic title) Chlupatý Hýždě. 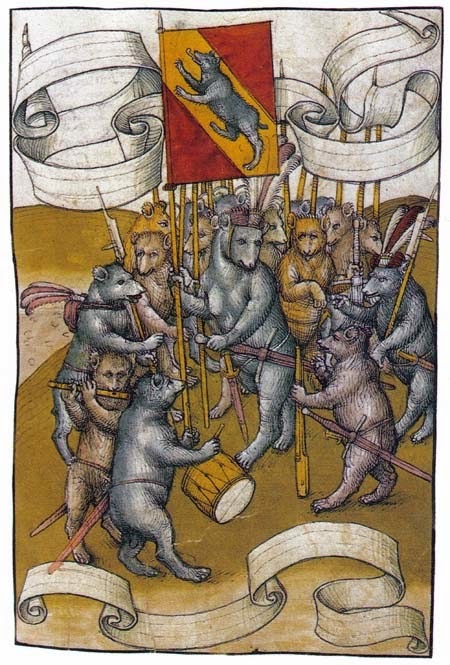 Second Column of 120 seasoned bears and a small number of allies is led by the cautious master of dogged defense Ald-Hetbear Stary Bote and is lagging 1-3 days behind the van. The Third Column composed of 180 warbears and the bulk of the human allies (and battle wagons) and of is led by the up and coming star in war-bear soldiery Snout-Captain Nová Lák and is averaging roughly a week behind the vanguard. Stranding against them are the faux-barbarian war-bands of Pohansko. Exact numbers are unknown (but likely to run anywhere from 500-1,000 strong) but well-known to all is their bizarre martial adornment in exaggareted Bronze-Age-ish war gear (complete with cow-hide shields and engorged, impractical bronze shoulder pads) and division into doctrinally -incoherent warrior societies handed down by the first adventurer king Pohan. Pinc himself is said to have fell arcane powers that can send even the most placid and content of hruz heads into a snarling rage over the most wee of issues. What Are Operational Conditions Like? The weather has finally turned autumn nippy in the southern Hill Cantons. Periodic chilly thunderstorms roll in from Stormchild's breath over the Persimmon Sea. The road east past the incestuous backhills shithole Bad Rajetz is barely a road, more a high place made up of the shattered backbone of an old stone Hyperborean highway surrounded by a sea of mud. The road runs through terrain much akin to Pohansko proper: craggy rocky ridgelines punctuated by cedar-breaks and vine brambles (and the occasional old beech and gnome-pine stand). What Do We Know about Pohansko? Well I will tell you all about that benighted place and its public secrets tomorrow, champ. And the waving of yellow banners. Pull up the fields! Pull up the fields! Cannot rest on human foundations. 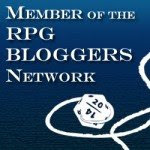 I'm rather enjoying my real world news mixing with my fantasy world news (you can judge which is which) so expect this to be a semi-regular post here on the blog. 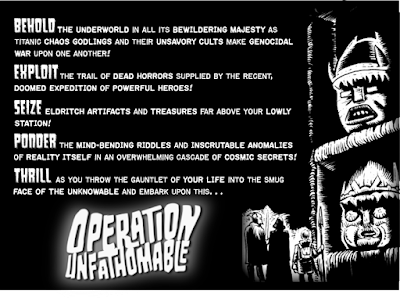 In things Hydra Cooperative related, Operation Unfathomable's Kickstarter has been launched and is trucking along. 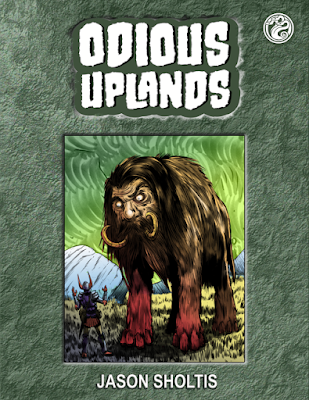 The first stretch goal is hit which means the Odious Uplands, an entire already-written book-length wilderness supplement is a go. Strange Stars OSR is at the proofing stage and I continue to attempt to push through that last bit of writing of What Ho, Frog Demons (the fourth and last of the Dunes series). 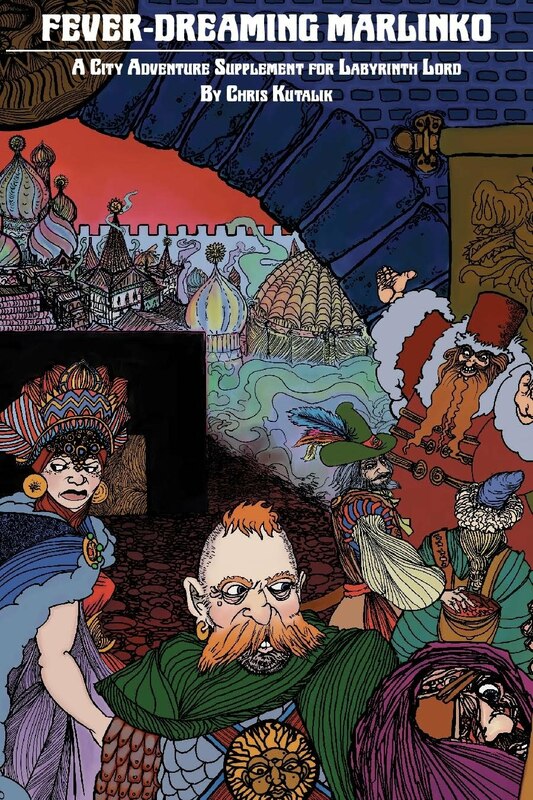 The fact-finding mission of self-styled Son of Mulmak, advocate of pan-dungeonism, is rumored to have met fierce resistance in the upper levels of the Mountain Hall of the Hyperboreans. An anonymous source in the Guild of Condotierre, Linkboys and Stevedores says that the party ran into unexpected new residents calling themselves the Servants of the Antagonist, Ha-Vul the Great Restocker. The seemingly interminable election of the new Overking drags on with the 27 lord-electors continuing to bicker and maneuver and the powerless majority to debate and riot. A crowd of bystanders in Marlinko's Tomb-Plaza rescued a local Worker of Wood member who attempted to gouge out his eyes with an auger while simultaneously hanging himself on a self-made gibbet. The man was heard screaming repeatedly “please Sun Lord, just make it stop!”, an apparent reference to the length of the campaign season. For the first time since the Green Rye Uprising, Medved, hirsute divine Master of the Dunes, has called the muster for all leveled war-bears. 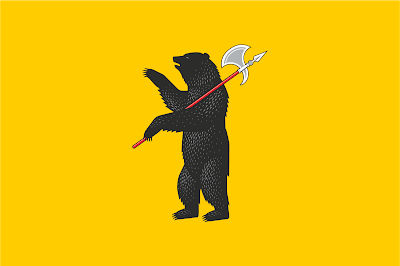 Under pretext of rough behavior, Pinc the Petulant, despicable petty tyrant of the pocket kingdom of Pohansko, has imprisoned a score of war-bears in his foulest dungeons allegedly to avoid paying back wages. Hosts of bearlings have been seen marching east and south through Marlinko Canton mustard banner unfurled with a new ballad on their hairy lips. Tho' I try to cheer my comrades and grunt hurray. Cheer up cubs here we come! In the free dunes of Medved's sandy home. The Hydra Cooperative is about to make another big ole leap forward in coming weeks. Next Monday, October 10th the Kickstarter for the one of my favorite (and way too self-deprecating) creators in this little scene, Jason Sholtis, is bolting out the gate. And yeah, yeah I know, like you, I have seen a thousand crowdfunding ships launched--many of them floundering still out there years later. 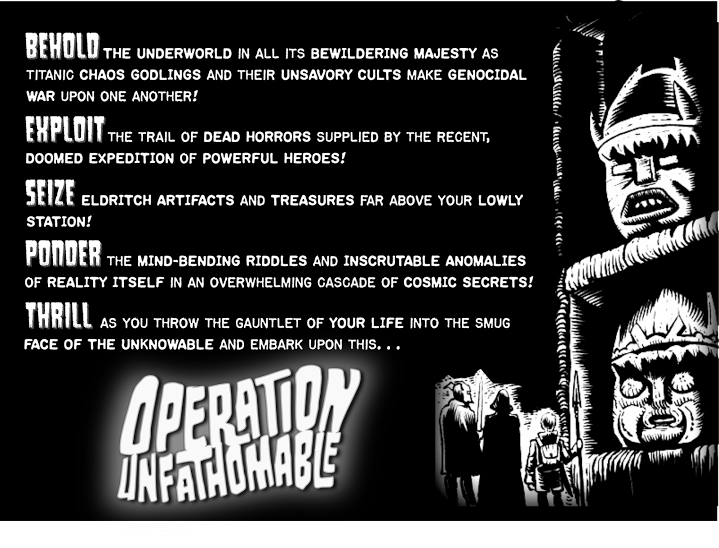 But not only is the extended-dance remix version of Operation Unfathomable in excellent shape going in (the main manuscript pretty damn clean, a host of illustrations completed and even the stretch goal material written and edited), it is also has a damn funny, pitch perfect Harryhausen-esque stop animation video that even if you don't pledge you should check out. Floor plans for the new not-bathhouse can be seen here. The Beneficial Society of Scavelmen and Engineers, Social has reportedly been testing campaign slogans for the Steeplejackers party claim to the Overkingdom throne on forcibly-detained groups of debt peons, glitter-slyphs and law students. Sources say that the focus groups have zeroed in on the catchy, yet opaque slogan of “Superlative Souls are Deplorable” as the party's new war cry. Fortunately with the electorate set at only 27 souls -- all of which already have their horses in the race – the slogan is nuncupatory. 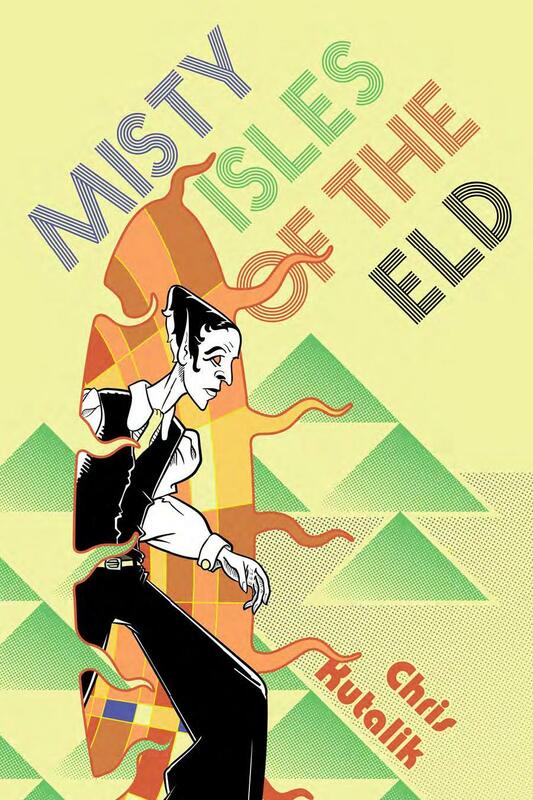 The self-styled Son of Mulmak, proponent of the heretical theory of pan-dungeonism and best-selling author of A Brief Relation of the World-Dungeon Unitary, As it Was Delivered to the Folk of Marlinko is gathering together a field work expedition for the faux-meadhall haunts of the Mountain Hall of the Hyperboreans with the explicit goal of “proving that a subterranean spiderweb of byzantine tunnels and treasure-house sub-basements connects all to All.” Undoubtedly the all-loving Sun Lord will strike him down and all who follow him in his hubris.